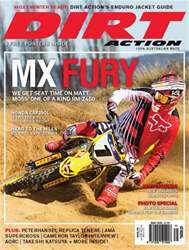 Issue 194 of DIRT ACTION magazine kicks off with a wicked cover shoot on Matt Moss' number one plated Suzuki RM-Z450. We spent some time running Matt's race bike around a deep, rough sand track and we came away surprised at what we found. Greg Smith heads to the hills for what can only be described as an epic trail riding weekend and when he returned he set KTM's Kirk Gibbs up for a sweet photo special that you don't want to miss. 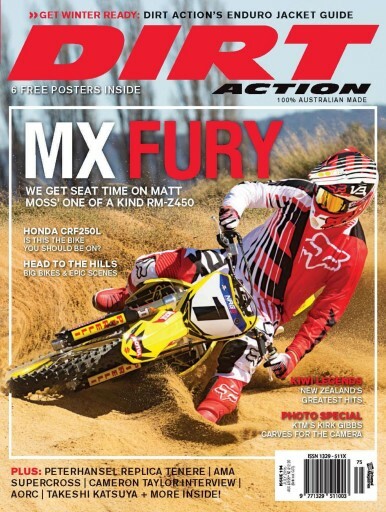 We caught up with multi time nationals MX and SX champ Cameron Taylor as well as the ever fast and friendly Takeshi Katsuya who might be staring down 40 but may just win the MX2 title in 2015. Simon Makker recounts all the titles Kiwi riders have taken back over the ditch and we get a close look at a beautiful Stefan Peterhansel replica Yamaha Tenere.